Thank you, Northeast Bank, for becoming a sponsor for the upcoming "Impact!" breakfast on April 10th. 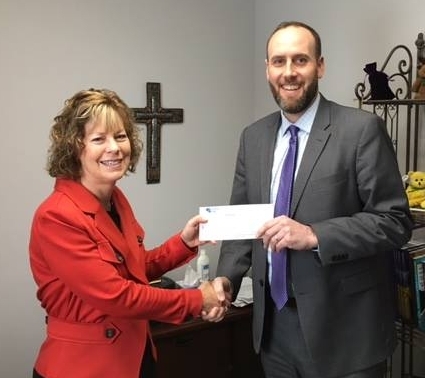 Mike Scholl from Northeast Bank stopped by our office to deliver the sponsorship check to Linda Wiza, our Executive Director. We thank God for business leaders who recognize the need and make addressing domestic abuse a priority! Our complimentary breakfast for Twin Cities businesses and civic leaders will be located at the Tournament Players Clubhouse in Blaine. You can learn more and sign up for the breakfast here.